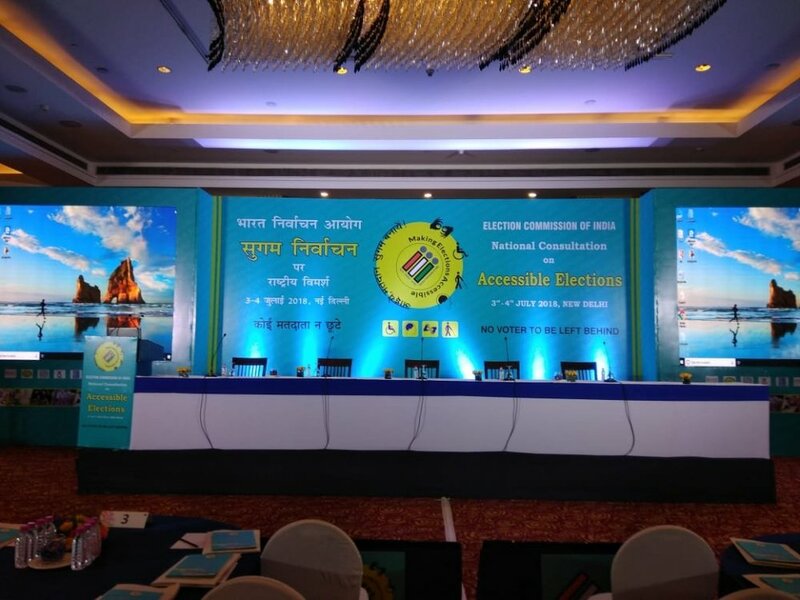 The proceedings of the National Consultation on Accessible Elections are about to begin. Stay tuned for live updates of the event! The aim of the Consultation is to develop a national policy which will enable the inclusion and enhanced participation of Persons with Disabilities (PwDs) in the electoral process. Lighting of the lamp by the Commission. This marks the beginning of the Consultation. 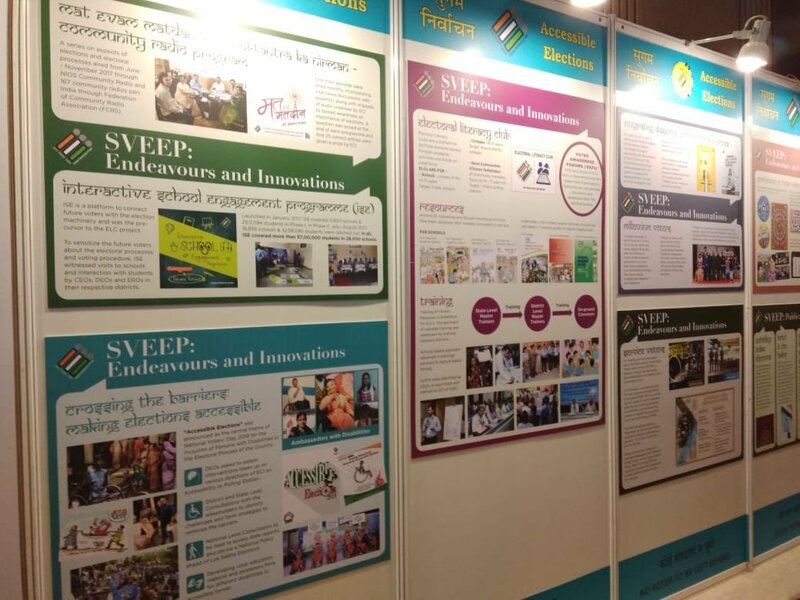 Inauguration of the SVEEP exhibition by the Commission - Chief Election Commission Sh. O.P. Rawat, Election Commissioner Sh. Sunil Arora and Election Commissioner Sh. Ashok Lavasa. Director, ECI Ms. Padma Angmo delivers her welcome speech. The Consultation is joined today by members of the Secretariat of the Election Commission of India, Chief Electoral Officers of States, members of Civil Society Organisations and representatives of national Political Parties as its participants. Senior Deputy Election Commissioner, Sh. Umesh Sinha presents his opening remarks about the consultation. The participants of the consultation have been presented with a Consultation Kit - all the contents of the kit have been prepared by Persons with Disabilities (PwDs). Election Commissioner Sh. Ashok Lavasa addresses the gathering. "The rights and guarantees provided by the Constitution of India to all citizens have to be exercised by all without barriers, without handicap" - Sh. Ashok Lavasa. He further adds that it is the responsibility of all public institutions to ensure that all are able to exercise these rights. The removal of the existing discrimination existing in the society is necessary. "The spirit of voluntary activities is important for achieving what we aim to achieve", Sh. Ashok Lavasa, Election Commissioner. Election Commissioner, Sh. Sunil Arora takes the podium to share his opening remarks with the participants. The National Consultation is a culmination of over 500 district level consultations and 36 state level consultations. Hon'ble Chief Election Commissioner, Sh. O.P. Rawat delivers his Key Note Address to the audience. Hon'ble CEC urges the participants to come up with a strategy for treating the insensitivity at hand. He encourages the participants to not restrict themselves in their recommendations to the Commission through the Consultation. The Commission launches the Systematic Voters' Education and Electoral Participation (SVEEP) Division' official online portal. 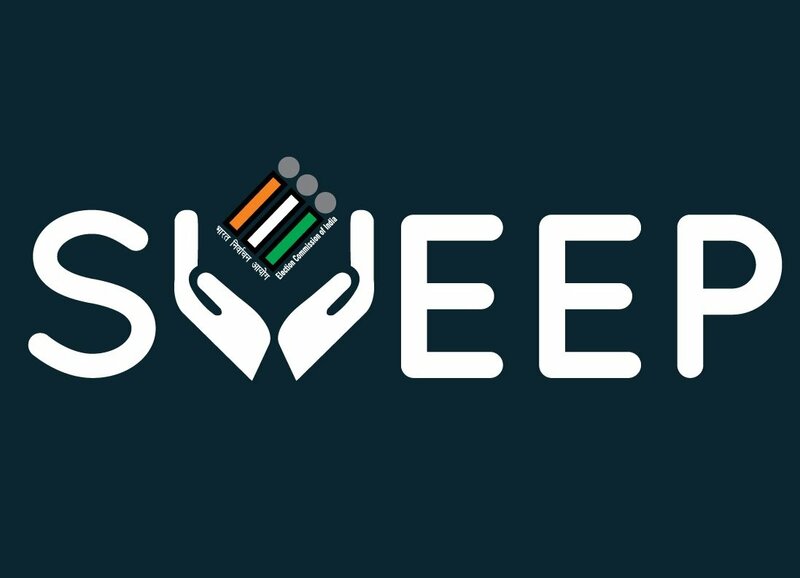 The SVEEP portal is a dynamic website that takes the Commission's efforts in the field of voter education forward through new media. It is a one stop solution to all the information needs of the voters. The new website offers easy and fast downloading, uploading and cataloging of multimedia Information, Education and Communication (IEC) resources on Voter Education. The portal is highly secure and has the added key benfit of Accessibility Features for our PwD electors. The Commission also launches cVigil. cVigil is a simple, android based mobile app through which citizens can promptly report unlawful campaign activities within minutes of having witnessed them and without having to rush to the office of the returning officer. The application connects the vigilant citizen with District Control Room, Returning Officer and Field Verification Unit and creates a rapid and accurate reporting, action and monitoring system. - as explained by Deputy Election Commissioner Sh. Sandeep Saxena. The first Technical Session of the Consultation has commenced. This session will feature 6 presentations by the Chief Electoral Officers of various Indian States that will share the Best Practices regarding inclusion of PwD electors in their respective States. Mr. Shiv Kumar from Departments of Empowerment of Persons with Disabilities gives the opening presentation to the session. Review of booklet "enabling voters with disabilities"
Dr. Aariz Aftab, Chief Electoral Officer, West Bengal, now on the dias for his presentation on best practices in West Bengal. West Bengal is presently developing an app that will help facilitate PwD electors on poll day. Through the app PwD electors will be able to describe their disability, mention the kind of facilitation required, provide their location and will be able to access various transportation facilities. Motivation was the focus in efforts. Ms. Sowjanya, Chief Electoral Officer, Uttarakhand presents the best practices of her State. Challenges in Uttarakhand include challenging hilly terrain, altitude, no road access, pregnant women, braille not understood by visually impaired persons, uselessness of wheelchairs due to the terrain and narrow door widths. Despite the challenges, the voter turnout of PwD electors in the last election recorded at 30%. Silent Village in Massar, where special BLO was assigned. Ms. N Manjushree, Deputy Commissioner of Mandya District, Karnataka presentation on initiatives taken for the PwD electors at District Level. Each group will be preparing a presentation on each of the topics. These presentation will be delivered tomorrow, on the second day of the Consultation, over thematic panel discussions. The Closing Session of the two day long National Consultation on Accessible Elections has now commenced graced by the presence of Hon'ble Chief Election Commissioner Sh. O. P. Rawat, and Election Commissioners Sh. Sunil Arora and Sh. Ashok Lavasa at The Lalit. Sh. Surendra Kumar, CEO Odisha presents a summary of recommendations made by the working groups of the Consultation for the first theme i.e. Accessible Registration Process including use of IT. Sh. H. R. Srinivas, CEO Bihar, makes his presentation on the summary of recommendations made for the second theme of the National Consultation, i.e. Accessible Polling Station including EVM/VVPAT & other Facilitation measures. Sensitization of the polling officers for assisting the PwDs in using Electronic Voting Machine /Voter Verifiable Paper Audit Trail. Instructions in Braille and audio at the polling stations. Posters in large fonts for low vision voters. Feedback from PwDs/CSOs/visiting sheet remarks to improve upon existing facilities. Election Commissioner, Sh. Ashok Lavasa is now on the dias presenting his remarks on the recommendations of the Consultation. Senior Deputy Election Commissioner, Sh. Umesh Sinha takes the dias. Important announcement made - The Electors' Photo Identity Card (EPIC) for visually impaired electors will now also be made in Braille. The first two Braille EPICs presented by the Commission to their recipients. The Strategic Framework on Accessible Elections has been released by the Commission. The framework details on Barriers, Inclusive Voter Education, leveraging technologies, research,study and knowledge sharing, Role of Partner Departments, Role of Educational Institutions, Role of CSOs, Media, Poll Volunteers, Training and sensitisation of staff, Alternative voting methods, and the set up of committees. Hon'ble Chief Election Commissioner, Sh. O.P. Rawat presents his final remarks on the two day National Consultation on Accessible Elections. The inclusion of a window on sign language interpreter in all audio visual material produced for training or voter education. Accessibility Division will be set up in the India International Institute of Democracy and Election Management for continuous research and development of facilitation measures for PwDs. Hon'ble CEC ends his address on positive and motivational note, encouraging all to do all in their power to enhance the participation of PwD Voters in the electoral process. Ms. Padma angmo, Director, SVEEP delivers her Vote of Thanks to all stakeholders of the National Consultation. The National Consultation on Accessible Elections has been officially concluded. Election Commission of India’s Systematic Voters’ Education and Electoral Participation (SVEEP) Division in consonance with the NVD theme for 2018 is organising a two-day National Consultation on Accessible Elections on 3rd and 4th July, 2018 in New Delhi. 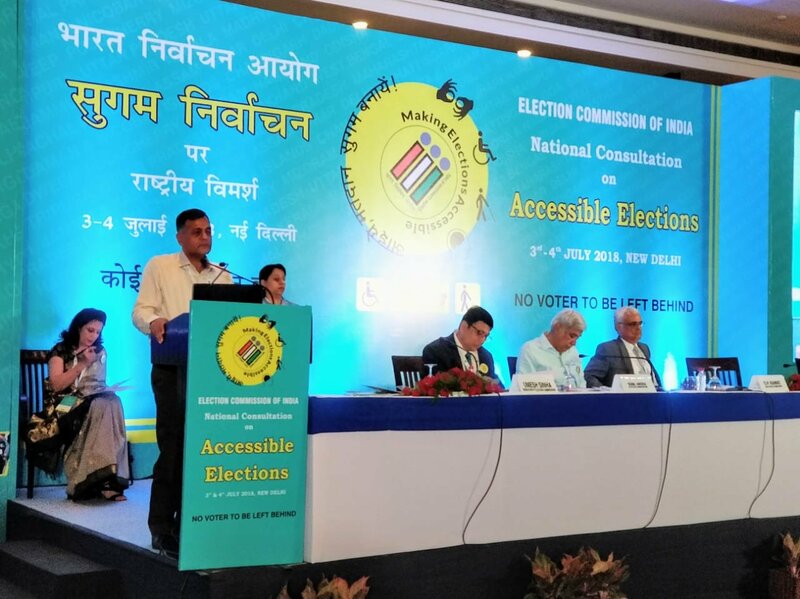 The Consultation would mark the culmination of a series of District and State-Level workshops undertaken in pursuance with ECI’s commitment to enhance the processes of engagement, facilitation and participation of specially-abled voters. 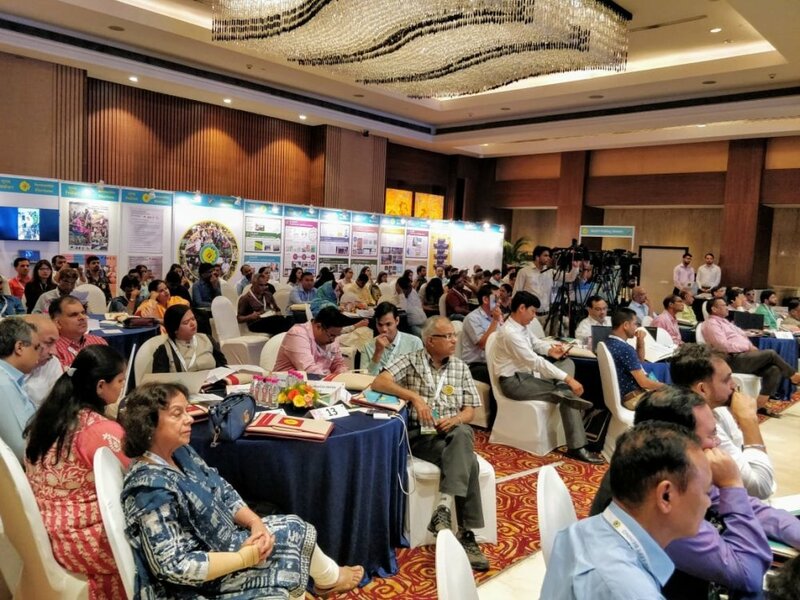 Building upon the acquired knowledge the National Consultation would seek to generate tangible results and real, positive impact at a pan-India level with regard to the key stakeholder category of Persons with Disabilities.